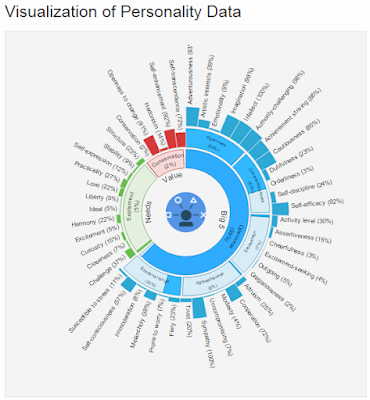 eGov AU: Can an AI understand your online personality? How about your agency's online persona? Can an AI understand your online personality? How about your agency's online persona? I've been having a play with IBM Watson's Personality Insights Service. The service uses "linguistic analytics to extract a spectrum of cognitive and social characteristics from the text data that a person generates through blogs, tweets, forum posts, and more." While this is quite a mouthful, the service provides an interesting external perspective on how individuals and organisations present themselves online. You are shrewd, skeptical and tranquil. You are philosophical: you are open to and intrigued by new ideas and love to explore them. You are empathetic: you feel what others feel and are compassionate towards them. And you are imaginative: you have a wild imagination. Experiences that give a sense of prestige hold some appeal to you. You are relatively unconcerned with tradition: you care more about making your own path than following what others have done. You consider achieving success to guide a large part of what you do: you seek out opportunities to improve yourself and demonstrate that you are a capable person. In a nutshell that's not too bad an analysis. However what happens when we analyse a government agency's social media presence? In this case I decided to analyse the Digital Transition Office (DTO), by taking all their blog posts from July to November (excluding guest posts) and plugging them into the Watson Personality analyser. You are heartfelt and rational. You are self-controlled: you have control over your desires, which are not particularly intense. You are empathetic: you feel what others feel and are compassionate towards them. And you are proud: you hold yourself in high regard, satisfied with who you are. Experiences that make you feel high efficiency are generally unappealing to you. You are relatively unconcerned with tradition: you care more about making your own path than following what others have done. You consider helping others to guide a large part of what you do: you think it is important to take care of the people around you. Now that's a pretty good result for an organisation (except maybe the pride bit). It seems to me that the personality that the DTO is projecting through their blog is fairly close to the approach and persona that the DTO wishes to portray within government and more broadly in the community. Here's a review of the Department of Immigration's Migration blog, taking all blog posts from October 2014 onwards (to provide a sample of the same size as the DTO and my blog). You are heartfelt, tranquil and skeptical. You are calm under pressure: you handle unexpected events calmly and effectively. You are self-assured: you tend to feel calm and self-assured. And you are philosophical: you are open to and intrigued by new ideas and love to explore them. Experiences that make you feel high well-being are generally unappealing to you. You are relatively unconcerned with taking pleasure in life: you prefer activities with a purpose greater than just personal enjoyment. You consider achieving success to guide a large part of what you do: you seek out opportunities to improve yourself and demonstrate that you are a capable person. On the money, or off the mark? Now of course this kind of process is flawed. An AI can only read the words it sees, it doesn't have a broader picture of an individual or organisation and it has been programmed to respond in given ways to given words or phrases. However it does highlight an important point about communicating online, and in every medium, in the way you wish to be seen. Does your online persona represent how you wish to be seen? Is it consistent across platforms? Is it appropriate to your organisation's goals? 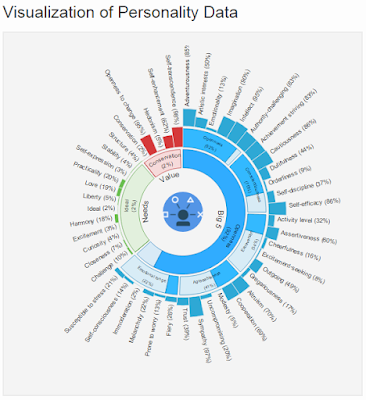 It's worth using tools like this to check how your organisation is communicating and identify if there's attributes you are portraying which are contrary to how you wish to be seen. If your online persona isn't aligned closely with your goals it can create issues in how people see you and how they engage with you - leading to greater negativity in interactions and diminishing trust and respect. So think carefully about every post, tweet and status update - do they represent and reinforce your organisational values, or do they damage your image in the public eye.